Our primary carrier is FedEx with DHL for some overseas shipments. We also use Canada Post where rates or delivery schedules may provide better service to our customers. While we try hard to ship promptly, we will hold shipments if we determine that weather issues may cause damage to the shipped item. 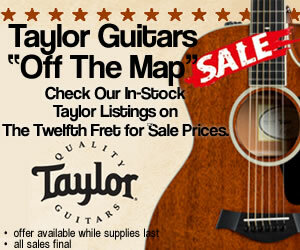 Please note that The Twelfth Fret provides price and shipping quotes, but any import duties your government may charge are beyond our control and we can not predict or advise what they will be.